Sole considers that the new F85 is “The Best Folding Treadmill On The Planet.” Is that even possible with all of the choices available? Do you think they are reaching with that statement? After our review, we have to agree with them! This treadmill was updated in 2014 to become a top-of-the-line machine that includes everything a serious runner needs to train adequately. You will find a strong motor, excellent cushioning, large track and incline. There is even an MP3 port with high-fidelity speakers that will make your workout fly by. What’s New With The F85? When compared to the F83, you will notice a much higher weight capacity of 400 pounds with a 4.0 CHP motor and track that measures 60″ x 22″. Even when comparing to the older F85 model, it has a more powerful motor, technologically advanced display, and a reinforced frame to support more weight. High-Quality Parts: Sole treadmills that are designed for the home with many commercial-grade parts: thicker rollers to improve track life, higher horsepower with a lifetime warranty, along with high-cushion tracks that reduce the amount of impact on the joints. 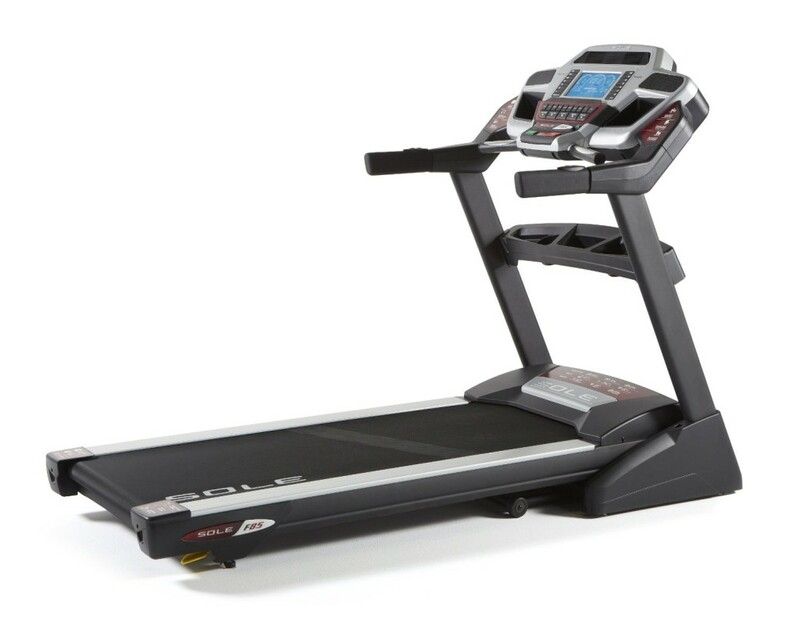 The new and improved F85 is among the highest in quality in folding treadmills. The design is based off of those in elite hotels, and is more than capable of meeting the training needs for an individual with a home gym. Motor: The F85 is designed with 4.0 CHO motor that is able to support a user weighing up to 400 pounds. Track: In many treadmill reviews, owners complain about the cheap parts that are used and the need for a lot of maintenance. With a Sole treadmill, life and exercising becomes much easier. The machine is designed with a two-ply design that runs over the rollers to provide extra durability. In addition, the F85 uses CushionFlex technology which has been proven to reduce joint impact by up to 40% as opposed to road running. This helps to reduce the amount of impact reduction compared to other brands. Incline: The running surface is a generous 60″ x 22″ and inclines by 15 degrees. When you work on an incline it is much more efficient to burn calories. Console: All of the workout data is displayed on a 9″ LCD screen. Audio: The F85 has incredible speakers that are able to play music from your iPod or MP3 player. Compact Design: The F85 has the ability to be folded vertically to help save space in the home. In addition, the Sole’s patented horseshoe design will help to keep the unit sturdy while working out. Extras: The F85 also includes a wireless heart rate monitor which is at least 99.9% accurate. This will automatically calculate your best heart rate according to your gender, age, and other variables. The built-in console fan can be used to extend the amount of time on the machine and the built-in controls on the armrest make life easier. Warranty: The warranty on the Sole treadmill are some of the best in the business. The F85 has a lifetime warranty on the motor, frame, and deck. There is also a five-year warranty on all the electronics and parts as well as two years of in-home labor. Limited Programing: One of the bad things about the line of Sole treadmills is the amount of workout programs. They include six programs such as incline and hills, two user-defined programs, and two heart-rate programs. If you are looking for a treadmill with a lot more option and combinations, take a look at one with iFit. Size: Another drawback we found is the unit’s size when it is extended. In smaller rooms, the 80″ length will be far too much. The Sole treadmills are highly recommended by the geeral public. You get top-notch customer service and the enjoyment of having a piece of equipment that is going to last for years. This model in particular has a highly-powerful motor, longer track, and higher weight capacity. The new F85 treadmill is recommended to heavier trainees and those who may need a extra-large display. The less expensive price is also going to be a high selling point with individuals. As you can see, Sole was not reaching when they claimed this to be the world’s best folding treadmill.